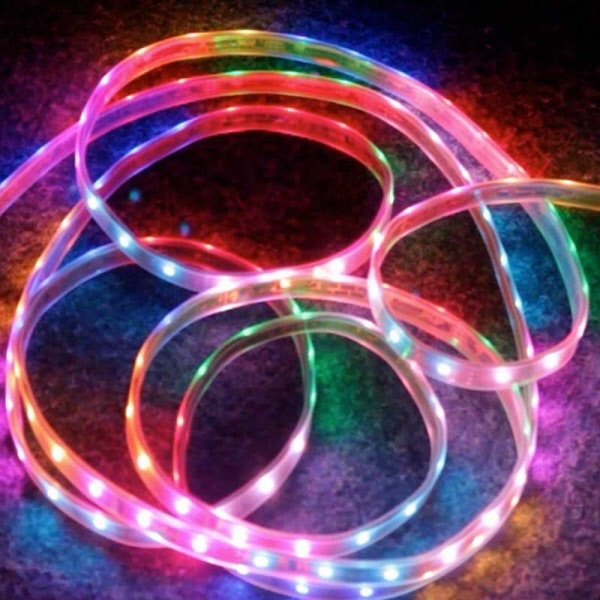 The dynamic LED strip is supplied on a 5m roll. This is very impressive LED tape, with a total of 150 tri-colour LED's (30 per metre). It can only be controlled via its own dedicated controller (sold separately see below) that has a plethora of built-in programs that are ideally suited to any internal or external applications. The LED tape is sealed inside a plastic sleeve giving it an IP-67 rating but also helps give a bright, constant, smooth colour effect. For those applications where a full roll is not necessary, the strip can be cut at 3 LED (100mm) increments. The colour strip only draws a minimal amount of power and produces virtually no heat. This makes it ideal for professional installations in the home, hotels, clubs and even in the bedroom.